For Sara Manser her ‘still point’ is presented in this exhibition through a series of works on paper and related objects, which express for her a nature often unseen and generally unappreciated. The mud and shadows of the mangrove forests are her point of visual focus and inspiration, as well as the scraps of nature alongside railway lines and sprouting from the cracks in our urban environments. 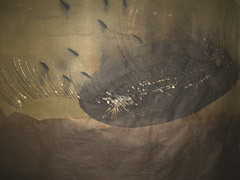 Image: Sara Manser, The tide reveals… (detail) 2011, ink, wax, charcoal and monoprint on Kozo paper. Courtesy of the artist.